In this new Paste Drink series, we take a step back from the craft beer hype cycle to offer our enduring endearments to some of our favorite beers that have stood the test of time. These beers should be considered paragons of their respective styles, and just because they’re available year round (in most cases), that never makes us any less excited to crack one open. These are the Beers We Love, and they’ve earned our respect. Once upon a time, in the craft beer days of yore, if you ordered a beer labeled as “American pale ale” you could reliably expect a few things to be true. First, that beer would probably be golden to deep amber in color, the term “pale” simply implying a beer that wasn’t black or brown. Secondly, you’d be expecting a beer that featured a subtle, easygoing balance between malt and hop aromatics and flavors. Not a bombastic hop delivery vehicle, like pale ale’s big brother, IPA—a genuine, harmonic balancing act. In other words, you’d be expecting to be served a beer almost exactly like Deschutes Mirror Pond Pale Ale. 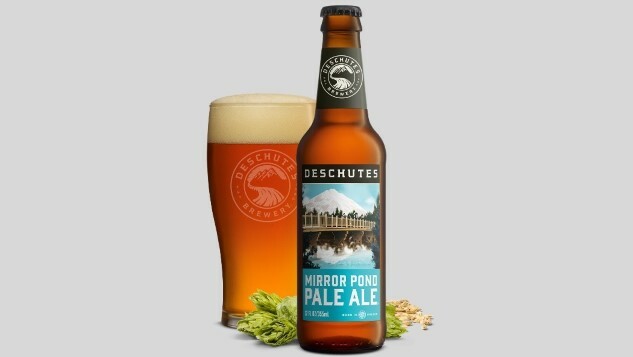 Celebrating its 30th birthday back in July, an incredible milestone for just about any craft beer, Mirror Pond remains the unsung hero of Deschutes, the country’s 10th largest craft brewery by volume, at least by the Brewers Association definition. A beer that played a huge role in bringing the company to where it is today, it’s a perfectly preserved time capsule of an earlier moment in pale ale evolution, but that doesn’t mean it now comes off as staid or uninteresting. If anything, Mirror Pond reminds us of just how satisfying a more reserved approach toward classic styles can be. And unlike the brand’s Black Butte porter, it actually needs a champion. We’re here to be that champion. Read a review of a modern, hop bomb of a hazy pale ale and you’re still likely to see the word “balance” crop up more often than not. It’s a funny concept, balance. You’ll see the term used today to describe beers overflowing with hop-derived flavors, as long as they complement those flavors with the slightest bit of malt presence as well. Might we suggest that this probably isn’t an appropriate use of a term like “balanced”? It’s not that we dislike modern pale ale and IPA styles—we enjoy well-made hazy, NE-IPA juice bombs just as much as most people do in 2018—but the defining characteristic of those styles is the exact opposite of “balance.” Instead, NE-IPAs (and especially their milkshake and smoothie offshoots) are defined by cartoonish excess. At their best, they’re gleefully decadent, over-the-top, hugely flavorful and memorable experiences. But most aren’t subtle, and they certainly aren’t “balanced.” If you make a “balanced” NE-IPA, you’re doing it wrong. But you know what genuinely is? Mirror Pond Pale Ale. This is a beer that truly deserves that kind of humdrum descriptor we throw around far too often. Moreover, it shows the drinker exactly why balance is something you’d be actively courting, as a brewer. Just ask a brewer. Why yes, Mirror Pond does exist in cans these days as well. On the nose, Mirror Pond presents as deceptively mild, especially when cold. It’s a beer that is better when it’s been in the glass for a couple of minutes, which allows a profile of biscuit, grain, toasted bread, florals, pine and grass to steadily emerge. A drinker accustomed only to modern juice bombs would no doubt proclaim it “boring,” but Mirror Pond’s objective isn’t to overwhelm you by proving how much hop character it can cram into a bottle. Its objective is simply to be pleasant, and it is. One might notice some similarities to the renowned Sierra Nevada Pale Ale—another beer famous for its 100 percent Cascade hop bill—but Mirror Pond differentiates itself with a more expressive English yeast, rather than Sierra Nevada’s classically clean Chico strain. On the palate, Mirror Pond really starts to open up, first on the malt side of the spectrum (toasty, biscuit, light caramel, clover honey) and then via the classic profile of Cascade hops—wildflowers, grapefruit zest and spruce tips. Bitterness is mild, but present, balancing out the subtle sweetness of light crystal malt, but it’s still a beer you would certainly describe as “dry” overall. Toasty, herbal and grassy as it continues to warm, it’s a beer you’re not likely to allow to get warm in the first place, as its balance and deft use of mild flavors both encourage big swigs. If it’s been a while since you’ve had anything that wasn’t DDH, it’s a level of drinkability that you might actually find rather dangerous. Regardless, this is a beer for drinking in quantity, 4 oz brewery taproom taster glasses not representing its natural home. It begs for a pint at least—that, and maybe a slab of fish and chips too. And some pretzels. And a second Mirror Pond. Still, it’s perhaps unsurprising that even within Deschutes as an organization, a 30-year-old beer recipe tends to get looked upon with some incredulity by new brewers. According to Faivre, incoming employees don’t always cite Mirror Pond as among their favorites—at least at first. For a beer that has been around as long as Mirror Pond Pale Ale, it’s only natural to look at the first-brewed date of 1988 and assume that the beer has been constantly available ever since, but it’s actually not the case. In actuality, Mirror Pond began its life as a seasonal release, and it didn’t become a year-rounder until almost 10 years later, in 1997. Although often positioned as a contemporary or sibling of the famed Black Butte Porter, it was never a beer that received quite as much attention—except from its longtime fans. In fact, during an unrelated story I was recently working on related to Avery Brewing Co., founder Adam Avery happened to say the following: “Mirror Pond was one of the first and best craft beers I ever drank, when I first moved out west.” And he’s certainly not alone. Since 1990, the beer has won more than 20 awards of various origins, including four medals at the Great American Beer Festival—most recently a gold medal in 2010. The old school Mirror Pond label that many of us surely remember fondly. But historical goodwill only goes so far. Even as the beer has undergone subtle variations over the course of decades, mostly driven by the movement to ever-larger brewing systems, Deschutes has worked to keep its original profile intact by employing new techniques that better suit its scale. But the question is always there—even if they succeed in preserving Mirror Pond as a historical classic, can it remain the kind of beer people want to drink in 2019 and beyond? At a time when the most zealous of beer geeks are lining up down the street for release dates of 16 oz cans of hazy IPA (and paying $20-plus per four pack), is subtle, balanced APA simply something no one is asking for? Brian Faivre isn’t shy about admitting that selling Mirror Pond has gotten a bit harder, as time has gone by. This is surely a familiar sentiment to brewers of classic pale ales and year-round staples at regional breweries all over the U.S. In a time when it often seems like consumer interest is only triggered by novelty and trend-chasing, it’s brands like Mirror Pond that have borne the brunt of the craft segment’s slowdown in growth. Breweries like Sierra Nevada or New Belgium have watched brands such as SNPA or Fat Tire struggle to hold their ground, to the point that “holding steady” rather than actively shrinking is a major victory. But Faivre remains positive. There’s enough Mirror Pond fans out there, he says, to keep a 30-year-old, beautifully balanced, wonderfully subtle beer in a healthy position for the conceivable future. Here’s hoping that another 30 years from now, Mirror Pond Pale Ale is proudly celebrating another anniversary.